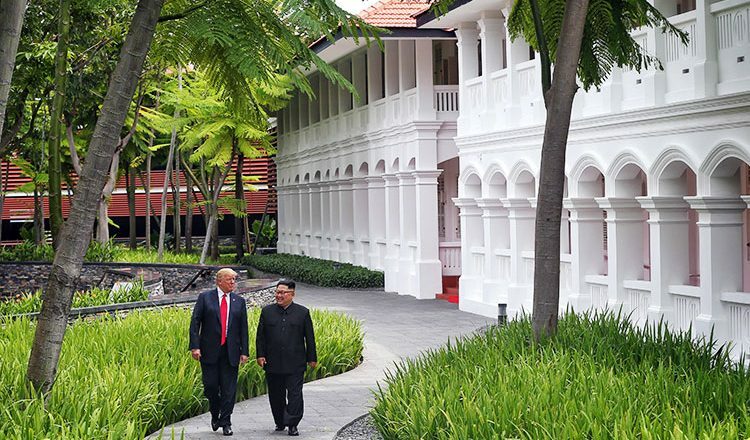 The second Donald Trump-Kim Jong Un meeting could be in Vietnam this month. Robert E Kelly argues that there is a need for the US-North Korea summit this time to be far better than last year’s throw-together-at-the-last-minute made-for-TV spectacle and focus should be on limited deliverables which are actually possible. If press reports are accurate, US President Donald Trump and North Korean supreme leader Kim Jong Un will again meet this month. They met for the first time last June in Singapore. Rumour suggests this meeting will be in Vietnam. The first summit was sharply criticised as a photo-op for Mr Trump – as the first US president to “boldly” meet the North Koreans face-to-face – and for Mr Kim – as the first North Korean leader to nab a meeting with the most powerful person in the world. Style and process dominated that event. There was much talk of “drama” and “making history”. Farce made it worse. Dennis Rodman naturally showed up at Singapore to cry on CNN in a PotCoin t-shirt and “Make American Great Again” hat. (Seriously.) Even that hack BBC Dad somehow showed up on BBC in Singapore to provide commentary. This has not stopped Mr Trump or South Korean president Moon Jae-in from speaking as if substantive movement has occurred. Mr Trump has repeatedly said on Twitter and sympathetic media (read: Fox) that the North Korean problem is either over or improving, that he has a great relationship with Mr Kim, and so on. Mr Moon has spoken similarly, saying repeatedly that Mr Kim wants denuclearisation when the North Korean leader has only vaguely hinted at this himself. In fact, North Korea has still not surrendered any warheads, missiles, or launchers. We still lack a concrete, costly signal that Pyongyang actually wants or will do what Mr Trump and Mr Moon keep saying they are doing. Stepping back from this magical realism should be the first step for a better second summit. The analyst community can see that North Korea has not really moved on strategic issues, creating a widening and increasingly weird dissonance with reality, as, for example, when Trump enthusiasts threw around the idea last year that the US president should win a Nobel Prize. The North Koreans will presumably ask for a price for an inventory. It is too late to use the prestige of a POTUS-meet itself as a trade. Mr Trump must actually give the North something, most likely sanctions relief or simply cash. Once we know what the North Koreans have (or at least claim they have), we can then begin the debate on what we should give them in exchange for what they have. There are many possible modalities here. Rumours are floating that Mr Trump might offer a US troop withdrawal from South Korea as a bargaining chip. That is a huge giveaway. If United States Forces Korea (USFK) is really in play, Mr Trump should secure a huge counter-concession for that – namely a fair chunk of North Korea’s nuclear and other weapons of mass destruction. Far more likely is a more limited swap, because giving up USFK for dozens (?) of warheads would require a level of strategic trust between the US and North Korea than exists at moment. USFK’s proposed departure would also activate enormous bureaucratic and popular resistance in South Korea and the US. Neither Mr Trump nor Mr Moon have laid the groundwork for such an enormous step. That is just one suggested trade, but there is much the US might offer the North: sanctions relief, aid, cash handouts, a declaration formally ending the Korean war, diplomatic recognition, the removal (or retrenchment to Japan) of US air assets, and ultimately the withdrawal of US forces altogether. The trick for Mr Trump – and Mr Moon – is to get as much as possible from the North before giving up these bargaining chits. Here the record of the last year is disappointing. Mr Trump markets himself as a wheeler-and-dealer, but he has not managed to actually claw much out of the North. Nor has Mr Moon. Much of this is likely due to the haste of 2018’s détente. 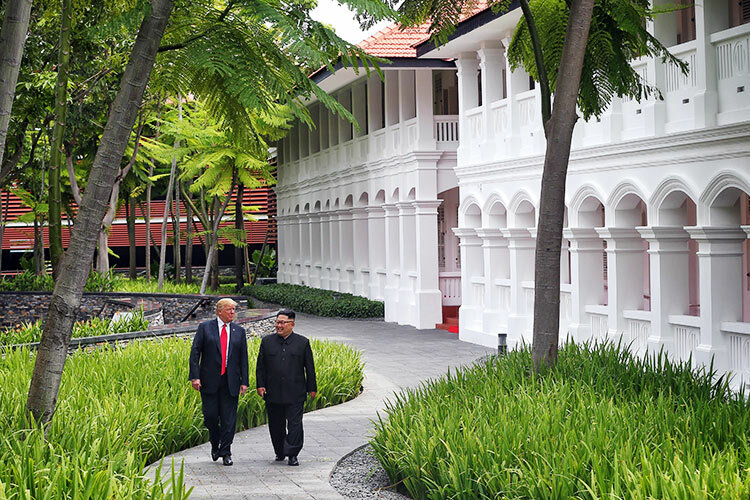 Mr Trump agreed to go to Singapore just weeks before the event, and he did no preparation. He winged it and predictably walked away with almost nothing. This second summit was also announced with almost no preparation time, and Mr Trump will almost certainly not ready himself meaningfully this time either. Mr Trump does not read or pay attention to his briefings, and he watches far too much TV. So who knows how he will respond when he meets Mr Kim? Mr Moon is better on this score of course. He takes the process far more seriously than Mr Trump, and he has put a lot of thought and energy into the North Korean issue in his career. That said, he has precious little to show for all the dramatic talk of a “new era” and a “new future of peace” coming from his administration. Despite an extraordinary rhetorical rehabilitation of North and extensive infrastructural and financial outreach to the North, the North still has not done much. Its gestures have mostly been token humanitarian – Korean War MiA remains returns or North-South family reunions. So the negotiations over the North Korean nuclear programme have still not started in earnest. Much of this essay could have been written ten months ago. We are still waiting, on the North Korean side, for an offer which puts their nukes and missiles seriously in play. And on the American side, we are still waiting for serious discussion of what the US and South are willing to concede.